Kori Carter has a chance to do something this year few young athletes ever get a chance to do – and the way she’s preparing and competing so far, it’s clear she’s planning to take advantage of it. Just two years into the hurdle game last spring, Carter was scorching the 300H in California, developing her now-trademark late-race acceleration and winning Arcadia and CIF in grand style. She also ran 13.89 in the 100s. But the 400H was a different animal. For many long hurdlers, there’s little difference for them in the 300s and 400s, but Carter found the extra 100 to be somewhat daunting. She was #4 on the 300H list last spring, just 0.32 back of first, but 11th on the 400H list, more than two seconds back of first - still very good, but there was a difference. Now usually, it should take a time well under 60 seconds to make a World Junior team. But Carter was in the right place at the right time last June, and finished 2nd in Columbus to earn that trip to Poland. At Worlds, she was eliminated in the first round, but obviously gained tremendous experience. Now here’s the kicker – she was just 16! Nine months later, the Claremont CA junior has a chance to do what few athletes could even dream of – get to jump back to the Youth level and fight for a gold after getting Junior-level experience. 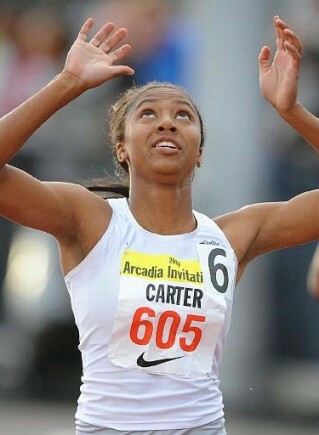 With that motivation no doubt on her mind, Carter has attacked this season full-throttle, getting her first sub-60 in the 400H two weeks ago and sweeping Arcadia with big 13.67 and 41.09 PRs last weekend. With more 400H wars at Mt. SAC and Penn ahead, this busy honor student took a few minutes to discuss her game with DyeStat Senior Editor SteveU. 1) Congrats on your Arcadia double. What were your thoughts, plans, and expectations going in and how do you feel about the results now after a few days reflection? Going into Arcadia – I can't lie – I was a little scared due to the depth of competition I was up against. But I kept telling myself that the work I have putting in this season would help me succeed (especially since I had a really good practice that previous Thursday). I'm still really happy with my performance, but being me, I'm never satisfied. So right now, I'm trying to focus on even better races and times. 2) One thing that was really noticeable in each race was your finishing power, in the last half of the 100H and the final 100 of the 300H. Was that part of your race strategy or was that a spontaneous development in reaction to what was happening in the races? My finish has always been strong, so my race strategy that race was to try to get out fast, but as you can see that didn't really happen. Coming off the turn, I knew I had to make a move, so I just did it. I wasn't worried about having enough stamina to finish, I just was thinking that I didn't want to lose. 3) You now have the nation-leading times in three hurdles races. What are the elements of your training that allow you to prepare successfully for both the long and short hurdle races? What do you do in preseason training to help allow you to be versatile enough to handle both of them? Is your main focus still the 300H and 400H, or is the 100H becoming a bigger part of the picture now? I think my focus on hurdle technique is why I'm successful in both the long and short hurdle races. If I can get off the hurdle faster than my competition, whether it be the long or short hurdles, I'm more likely to win. I also love hurdling, which I think is a major contributor to my success and why I can't seem to choose between the long and short hurdles. This year I didn't play basketball, so I was able to actually train in the off season. I've been doing more speed work because I'm more of a natural long hurdler, so I'm learning how to be quick for the 100H. Neither hurdle race has been my focus, it’s just that in the past, I've been more successful in the 300H and 400H. I'm hoping this year I be able to be successful in all three hurdle races. 4) Even though you race 300H for the state meet in California, you seem to enter a lot of 400H races as well. What are the subtle differences for you in the two races and is the reason you compete in them as much to stay sharp at the longer race so you’re ready for the event in the post-season? And will you have a point where you’ll be able to take a break between all of these major invitationals you are racing and the state meet season? The difference between the 300H and the 400H is the 400H hurts a lot more. When I try to explain the 400H to other people, I tell them to think of how the "bear" gets them at the kick spot in the open 400, and then to imagine hurdling 30-inch barriers after that. The 300H is more of a sprint and a little more aggressive than the 400H, which is more rhythmic. I'm trying to get a lot of 400H races under my belt, so I won't have a fear of the race like I did last year, and so that when I compete in the postseason I can put down some good times and hopefully represent USA at the World Youth Championships, which is a huge goal of mine. As far as a break, that will have to wait until after running club track in the summer. Qualifying for 400H final at USATF Juniors last summer. 5) You have a unique opportunity this year to compete in the World Youth Championships for Team USA a year AFTER you competed in World Juniors in Poland. First, can you talk about that experience over there – about running a solid time and not advancing, but also just what you got out of the trip as a whole? Then, can you tell us about how that has motivated you for World Youth this year, where obviously you’ll be one of the oldest and fastest instead of one of the youngest? World Juniors in Poland was an amazing experience; I got to see what competition is like on an international level, while being able to call world-class athletes my teammates. I saw all types of cultures and had the honor of representing my country. I also got to see a level of hurdling to which I could aspire to. I took the World Juniors as a learning experience because I was a little over my head, being so young. So now that I'm running with girls my age, I don't see any excuse for bringing anything other than a first home. 6) I’ve read where you have been an all-around sports athlete in volleyball and hoops, but just really discovered a knack for the hurdles around 8th grade. Looking back now, can you talk about how that discovery has changed your life … and whether you still have a chance to play volleyball and hoops? I've always been a tomboy, so I've played almost every sport: basketball, football, soccer, softball, volleyball – you name it. So when I wanted to try track, I decided to become a pentathlete, because I figured after doing all these sports I must be good at the multi-events. I always thought I would be a pentathlete, but I soon found that I was pretty good at the hurdles and that I hated the 800m. In 8th-grade, I just fell in love with hurdling and its been my focus ever since. This year I had to stop playing basketball and I think the same will have to happen next year when it comes to volleyball. I really want to get the 300H record, but I know that it won't come without commitment, so I want to totally dedicate myself to hurdling my senior year. 7) You’ve competed for the SC Cheetahs as well as your school. Can you talk about the different coaches who might work with you, both in HS and club track, and what they each contribute to your overall program? 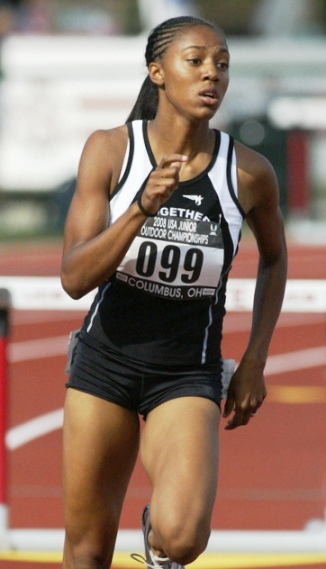 Is it true you’ve worked with pro sprinter Angela Williams, too? At Claremont, I am able to work with a great coaching staff: Coach Ancona is the head of the girls' team, Coach V is the head of the boys' team and also runs all of the interval work, and Coach Ede trains the hurdlers. I started working with Coach Richard Holmes this year and he really has helped me get more speed and better hurdle technique into my races. Coach Johnny Williams was my first coach of the SC Cheetahs, so I had the privilege of working with his amazing daughter, Angela Williams, on many occasions. 8) Looking at state and all of the potential post-season meets, what are your goals for the rest of the year in terms of times and placing in these championships? If I could get to 13.5 in the 100H and sub 41 in the 300H, I would be happy with myself for now. I also, want to double up at State in both hurdle events. In the postseason, I want to represent the US in the World Youth Championships and hopefully bring a gold home. 9) I’ve read where it seems you are very close with your parents and have a strong faith. Can you talk about the influence of family and spirituality on your athletic endeavors? I also saw in a story where you reportedly said, “I’ve never been to Europe before. I told my dad, ‘Do you know what this means? Sausage!’” I’ve got to think there’s an inside joke or a funny story there … is there? My family supports me so much when I'm running, so much that they'll stand at different spots around the track so I always hear someone cheering for me during my race. God is no doubt the number one source of my success; I pray before everyone of my races with the other girls. To me hurdling is a chance for me to give glory to God through this gift he has given me. As far as sausage goes, I always have food on my mind. So when I found out that I was going to Poland, I immediately thought of sausage and got excited. It’s ironic because I didn't even have a polish sausage in Poland; I ate mainly McDonalds.